For course and event dates through the year, sign up for my e-news for updates and keep an eye on my Facebook page. Wild Feast foraging courses are currently mainly held in the Rye and Three Oaks area, surrounded by fields, hedgerows and woodland. I hold both themed foraging workshops and full-day courses. My courses are close enough to London for a day-trip down to East Sussex, but for those who’d like to make a weekend of it, accommodation information can be provided – the Domesday village of Iden is just outside the picturesque, medieval town of Rye. Gift vouchers for courses are also available. And private walks, or bespoke vouchers for these can also be considered. 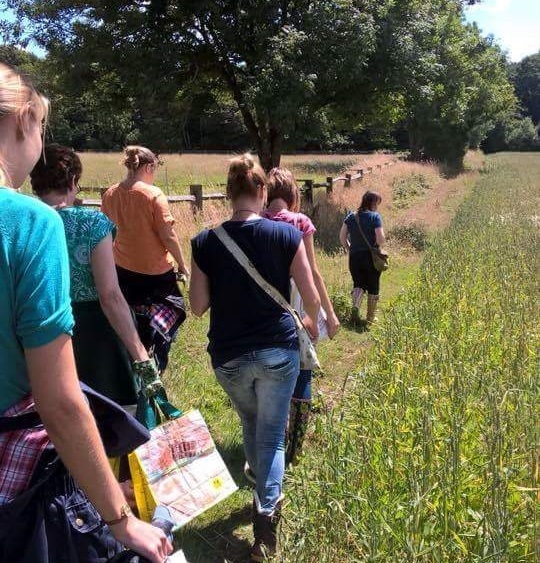 A memorable experience involving a country walk, a creative cookery session and a sociable meal. I’ll help you become more confident in recognising edible plants and preparing and using them. The day starts with a welcome and introduction covering the law around foraging for wild food, responsible foraging and plant identification, with wild-inspired tea and cake. We’ll then gather common wild herbs, greens, flowers, seeds and fruit (depending on the time of year), and I’ll point out some you should avoid – at least 20 species will usually be covered. It’ll be approximately 1-2 hours of fairly easy walking with stops along the way. Then back to the house to prepare lunch from some of our foraged finds with other fresh, seasonal ingredients sourced from local farms where possible. Everyone can join in some hands-on cooking before we sit down to relax and enjoy our delicious 2-course lunch at around 2.30pm, accompanied by a glass of fizz with a wild twist. 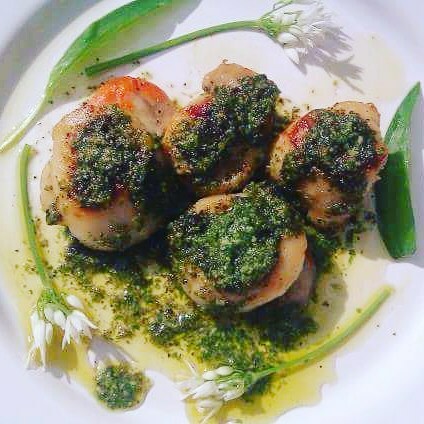 Sample lunch menu for spring (may vary depending on availability of ingredients): Wild greens and feta filo pastries, followed by Rye Bay scallops with a wild garlic dressing, rustic bread and salad with foraged leaves & flowers. Includes wild tea and cake, ingredients, use of kitchen and equipment, 2-course lunch with fizz, recipe sheets and a printed guide to foraging. The above spring courses are now fully booked, please complete the pre-booking form to go on the waiting list. You’ll get tips on identifying these useful fruits, and how to tell them apart from less edible imposters. After an introduction to safe, responsible foraging, we’ll gather abundant wild fruit. It’ll be approximately 2 hours of fairly easy walking, possibly with a stile to cross. After which we return to the kitchen. 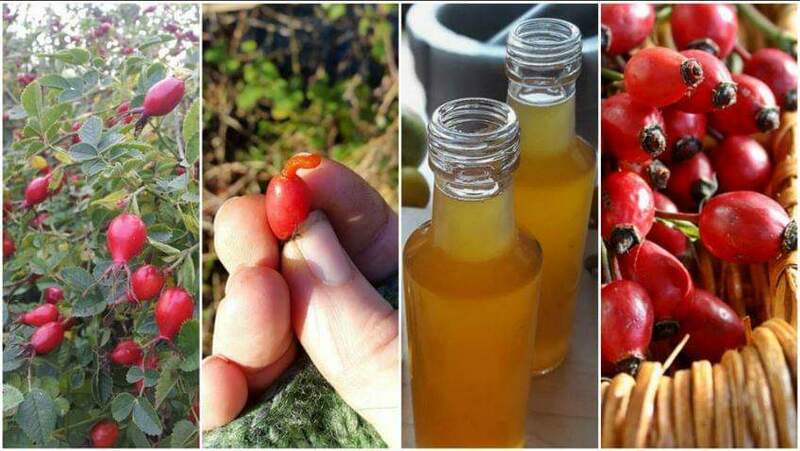 Examples of what we might make include rose hip syrup or rose hip ketchup, or you might get a rose hip liqueur started. Followed by a light lunch together. Includes refreshments, some food to take home with preserving containers, ingredients, recipe sheets and a printed guide to foraging. Iden courses are hosted by FOLKathome at a stylish, modern rustic house surrounded by beautiful countryside in the village of Iden, East Sussex, near the Kent border. The venue is some 40 minutes walk from Rye rail station, and we may be able to arrange collection. There is parking available at the course venue. The exact course location address will be provided on confirmation of course booking. Vegetarians and vegans can be catered for, provided you let me know on booking. If you have any special dietary needs or food allergies, you must tell me on booking so I can check if I can cater for you. As well as adults, young people of 12 to 17 can participate and must be accompanied by an adult. This particular route is not suitable for wheelchairs. Because of the cooking element, I’m afraid dogs are not allowed on these particular courses. All my courses are subject to Terms & Conditions which I email with payment details before purchase. By submitting a booking, course participants agree to my Terms & Conditions.